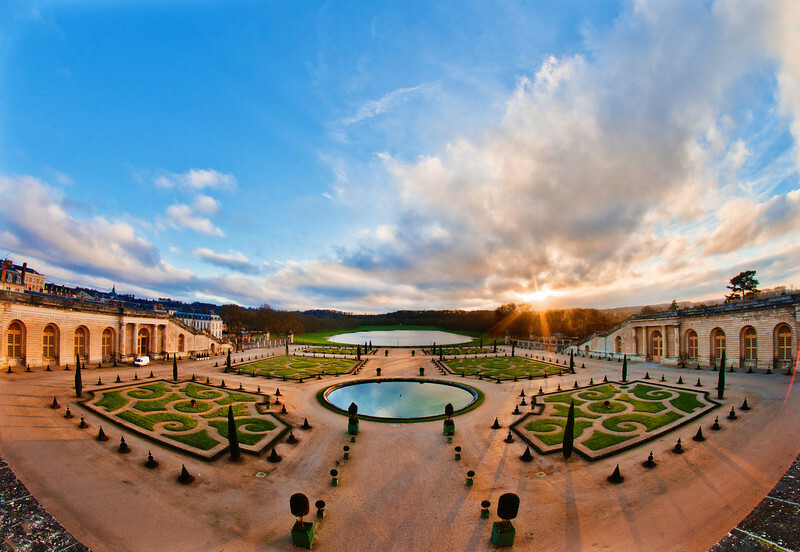 The Gardens of Versailles, even in winter, are truly a sight to behold. While the old adage that “photos don’t do them justice” holds true, I’m not so sure seeing the gardens does them justice, either. Much like everything at the château of Versailles, the gardens are all about excess. There are literally fountains and perfectly manicured lawns, flowers, and trees everywhere, and it’s too much to digest. You could walk for hours and hours and still not see all of the garden, even if you were jogging through the place. Supposedly, there are 200,000+ trees, and 200,000+ flowers here annually. Add to that a variety of other things, and it’s all almost too much. Maybe it’s just me, but I felt the same way about the inside of Versailles. Any one of the rooms would have been an amazing, beautiful place to spend hours just poring over the details, but after lavish room after lavish room, it all starts to lose its impact. Hence the “seeing the gardens” doesn’t do them justice comment. Besides walking through the gardens and seeing them, I’m not really sure what other ways there are to experience them…perhaps this is the rare case where photos actually are the better option? Photos can highlight certain aspects of Versailles, and present them in carefully composed and bite size portions that can be consumed slowly and over time. Now, I’m not suggesting that anyone should forgo visiting Versailles and instead just scour Google Images for Versailles photos once per day for a year, but you know what I mean. Hopefully. Photographed with a Nikon D600 and the Rokinon 8mm fisheye lens. As you may know, this is a crop sensor fisheye lens with and Nikon D600 is a full frame camera. For a while, this was my best option because I didn’t want to buy an expensive new fisheye. It was pretty easy to just crop out the area of the photos I didn’t need when using this fisheye, but I finally took the plunge and purchased the Zenitar 16mm f/2.8 fisheye (read my review of it). It’s a budget, manual-focus fisheye lens just like the Rokinon, and I love it. Processing on this photo was pretty basic, but has a couple of interesting twists. I did the bulk of my editing in Adobe Camera Raw; there I brought out the shadows, tamed the highlights (primarily the sun), and increased the contrast. I really wanted this image to pop with contrast, so in Photoshop CS6, I did something I normally don’t do: I used the burn tool on the mid-tones. I normally don’t do this because the burn tool is considered destructive. However, there are ways to use the burn tool in a non-destructive manner, it just can be difficult to control. To give myself more control over it, I duplicated my layer several twice, giving me a total of three identical layers. On the first of these layers, I burned the ground where the shadows of the trees are, to give them more emphasis. I really love long shadows in my photos, and I try to draw them out as much as possible when I can. I then adjusted opacity to (hopefully) prevent my burn from being overdone, and then added a mask to make sure nothing was unintentionally burned. After that, I went to my second duplicate layer, and burned the clouds to give them a bit more texture. Again, I adjusted opacity (very little of this burned layer is showing–about 20%–it may seem heavy-handed around the sun, but for some reason, that’s actually the way this scene looked) so the clouds don’t look like ridiculous HDR storm clouds, and then added a layer mask to the rest of the scene. Again, this isn’t an editing style I’d normally embrace or encourage, but you have to mix things up every once in a while to keep things interesting! What do you think of this processing method…do you ever use the burn tool? What about the idea that photos might actually do better justice to some scenes? Please share your thoughts, critique, etc., in the comments! Although the fisheye isn’t my favorite, I enjoyed reading the processing details of the photo. As a guy who doesn’t even use Lightroom to it’s fullest advantage, let alone Photoshop, that is an area where I have a lot to learn. It’s been 15 years since we saw Versailles, but of all the places we visited in Europe it’s one I have the least memory of. I think the “opulence overload” you describe might be part of it.